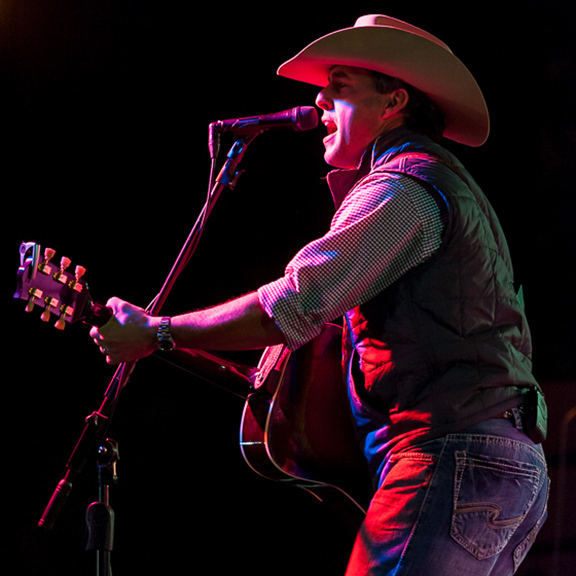 The spotlight is pretty much the same shape as the well-worn piece of wooden stage underneath the WSM radio microphone at Nashville’s Grand Ole Opry, where Abilene Christian University graduate Aaron Watson (’00) is about to find out how it feels to step into country music’s most famous circle, literally and figuratively. And he’s not nervous until you start talking about the icons of the industry who have preceded him. Watson is feeling on top of the world and the music business, and with good reason. Earlier this month he became the first male independent recording artist to have the top-selling album in country music, and he has been featured in Rolling Stone, Texas Monthly, on National Public Radio and the front page of Nashville’s The Tennessean. He’s standing in tall cotton, as they say in these here parts of Texas, a place where he has put deep roots and built a loyal following of fans who aren’t the least bit surprised at his success. With 12 albums in the rear-view mirror over the past 15 years, he’s got the perfect analogy: “I tell people I’m not up and coming. I’m slow and steady,” he said. We caught up with him recently as he prepared to make his Opry debut on Tuesday night, March 31. Joining him onstage will be Larry Gatlin, the Charlie Daniels Band, Pam Tillis, Easton Corbin and Eric Paslay. Gatlin, Daniels and Tillis are longtime members of the Grand Ole Opry, as once was Holly Dunn (’79). What music do you listen to on your tour bus and why? I stumble onto artists and different bands I like. I recently met Drew Holcomb while performing at the Ryman in Nashville and think he has a really cool sound. I’m always looking for positive forms of music that inspire me as a writer and as a human being. And it’s important it be music I can listen to with my kids around. In other words, if my wife – Kim (Calkins ’01) – doesn’t approve of it, we don’t listen to it. Like nearly every guy my age I grew up listening to the Red Hot Chili Peppers and U2. And of course I have my Willie [Nelson], Waylon [Jennings] and Merle Haggard music, my Guy Clark and Townes Van Zandt stuff. I listen not so much to the singers as the songwriters because I have more in common with them. Songwriters are more interested in the lyrics and tune, not the dance moves. One of the lines from a song on your new album says “I’d rather be an old fencepost in Texas than the king of Tennessee.” How will you explain that to the good folks who invited you to Nashville, assuming they ask about it? I love country music and country music is everywhere. Early in my career I went to Nashville numerous times and had the door shut in my face. But I had a dream and a passion for music and had to find a way to get noticed, and that was by being independent. That’s not a slam against Nashville; it’s just my story. My latest album is called “The Underdog” and I think that fits. I’ve been asked, “How are you doing this?” and I say, “I’m not, God is. If Jesus can walk on water, then making Aaron Watson have the No. 1 album is a walk in the park for Him. I give Him all the glory.” I try to stay focused on what matters most to me: my faith, my family and my fans. I’m in Nashville all the time; my booking agent is there, my record distribution is done in Nashville. But I’m a Texas guy. My momma lives in Texas and I’m a momma’s boy. You recently performed in a gospel concert at the historic Ryman Auditorium. What was that like? It was incredible. It’s the home of the original Grand Ole Opry, the mother church. It has more country music history than any other place in the world. To walk backstage and see pictures on the wall of Ernest Tubb and Elvis Presley and others; man, it was amazing. Most of all, my wife was there with me. So often, she has to stay at home with the kids, but to have her with me made it that much more special. She’s been there supporting me from the beginning, so I was more excited for all the people around me who have invested in me and believed in me before the music came along. You are the third former ACU student to play the Opry (along with Ronnie Dunn and Holly Dunn). Whom have you asked for advice about this opportunity and what was their advice? Well, now you’re making me nervous about the Opry thing by mentioning those two people and what they’ve accomplished. I’ve been doing this for 15 years and have played more than 2,000 shows. I haven’t asked for any advice about the Opry and think I’ll just stick to what’s got me this far: staying focused on faith and family. Play from the soul. 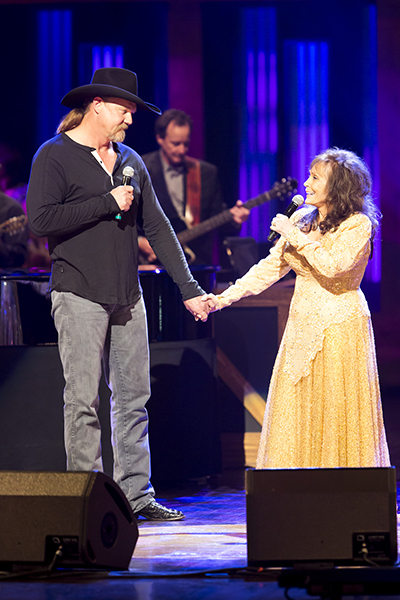 Most artists refer to their Opry debut as the highlight of their music careers. What thoughts are running through your head about standing behind the famous WSM microphone? I’m excited and thankful because this is a bucket list opportunity, but more excited for my little boys and the baseball games they have tonight. I get excited when it comes to being a daddy. So, I’ll get up on the stage and be genuine and be thankful. It’s an incredible honor and another great stage I can stand on and share my love for Jesus Christ. I have 20 other shows to play in April. There are people who will show up at each one of those and expect the same from me. To me they will be just as important as those at the Opry that night. 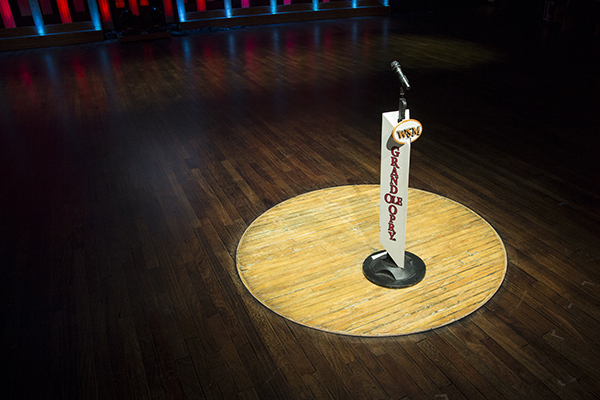 Assuming you can give a shout-out from the Opry stage to friends, fans and family, whom would you name and why? My mom and dad for sure. This will be sort of a 40th wedding anniversary trip for them. I am who I am because of them. My dad exposed me to all those great vinyl records and music while growing up. And my mom was the one who would have slapped me in the back of the head if I wasn’t singing in church. The reason why I can carry a tune is because of singing at church. My parents gave me a wonderful start to life and encouraged me to chase my dreams. I also plan to sing a song I wrote for my wife. The Opry is described by some as country music’s largest live jam session, both on stage and backstage. Whom do you most hope to meet while there? So many of my music heroes have passed on, so I don’t know who I’ll meet there. When I played the Ryman recently, it was awesome to sit around and visit with Steven Curtis Chapman. Early in my career, I got to hang out with Willie Nelson and sing a song with him on stage (“Honky Tonk Kid”). So Willie kind of spoiled me. Actually, I’m more excited to be sharing the stage with Larry Gatlin that night than anyone else. He is from this part of West Texas and helped me get started in the business. I met him for the first time in a downtown Abilene coffee shop. People forget that I’m only playing for 15 minutes at the Opry. This will be my first time to ever see it live, and I’ve got a really great seat that night to watch. Afterward, I plan to hang out in the lobby and shake hands until they kick me out. Texas music legend Ernest Tubb made history when he became the first musician to play an electric guitar at the Opry in the 1940s. What do you most want Nashville’s music industry to understand about Texans and the country music they make? It’s pretty simple. I’m a country singer and very much a Texan. George Jones was from Texas. George Strait is from Texas. There’s a lot of great country music out there, played all over the world, not just in Nashville. I have a business to run and I can’t put my destiny in the hands of somebody who doesn’t know me, my daughter, my sons, my wife. I enjoy the freedom of being an independent artist from Texas and making my own decisions without somebody telling me what kind of jeans to wear. Where in Texas do you enjoy playing most, because of its history or reputation or ambiance, and why? My backyard or at my ranch in Buffalo Gap. It’s kind of like we say about church: it’s not the building, it’s the people. I most want to play where my wife and kids are. Where are some of the oddest places you’ve written a song? I wouldn’t call it odd but I like to go hunting and write while enjoying the peacefulness of the outdoors. I’m supposed to be looking for deer but I find myself on the iPhone instead. The truth is I’m always writing a song and working on the ideas that are in my head. I’m always jotting down things on a piece of paper. My wife knows me well enough that when she finds stuff written on the back of a receipt or a piece of cardboard, to just put it on my desk rather than throw it in the trash. Me and my family have been such big fans of yours and we still are! Aaron, you are awesome! So happy for you and your family. Have a fun-filled time and continue on. Love and prayers to all of you. So happy for you Aaron! I’ve been following you since you started. It’s always a great night when I get to see you perform. But when you sing “Off the Record” I am beyond grateful! Your impact on my life was one I’ll never forget! Thank you again for your compassion and your kindness! Mark loved your music and would be thrilled to see how far you’ve come. Thank you for remembering Mark and my story in Gruene the last time I saw you! Hope to see you in NC soon! Congrats to you sir! I have followed you for years and you are a class act, both on, and off stage! The success that you have attained is well deserved. I wish you all the best in the future … And to me … You DO EXIST! Good luck Mr. Watson!